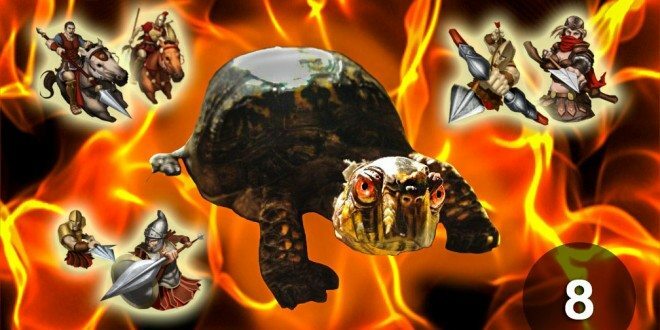 Welcome to part 8 of this guide to building a solo defense turtle. Recent parts of this guide looked at potential composition of 5 different balanced armies, then tested those 5 models of army composition in Part 6. Each of them was proposed as an army with a balanced composition of troops, with a mix of armies of 1 tier of troops, or an army with a higher tier core of troops with a meat shield of a lower tier of troop. Part 2 of this guide on research briefly discussed the issue of regular vs strategic troops, and suggested picking one or the other, rather than researching both regular and strategic, and building a mixed army of both types of troops. This post will look at that issue in a little more detail, and lead into a more conceptual discussion of the magnitude of troop boosts, in preparation for a more substantive discussion on troop boosts when we discuss hero gear in 2 parts time. The question we are trying to answer with this post is: is there value in training both regular and strategic troops types, and doing the necessary researches to get them to the same research level? This test was performed by using the same hero gear and boosts as per the tests in part 6 of this guide. As a quick refresher, the attacking hero was a defensively focused hero, with a fair amount of attack debuff, and high on health and defence to minimise overall losses from performing these tests. 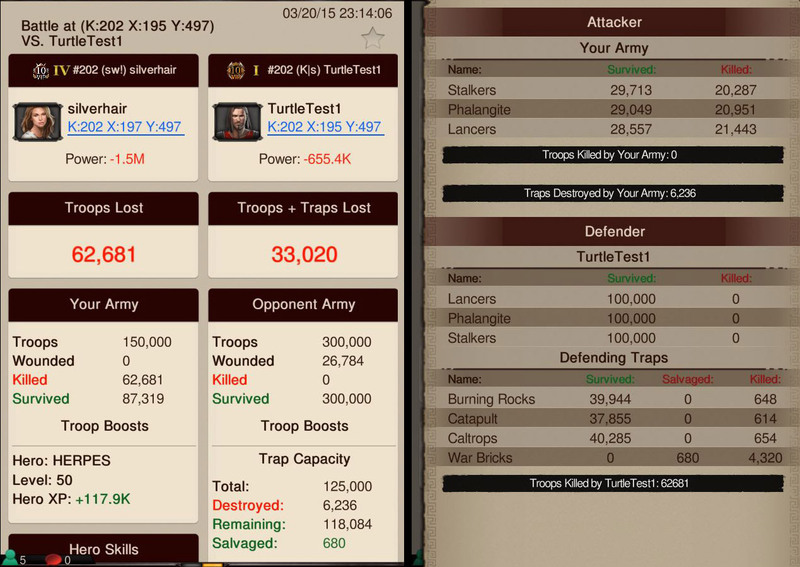 The defensive setup was as per the attacks 1-4 on TurtleTest1, with the main difference being defensive troop composition. 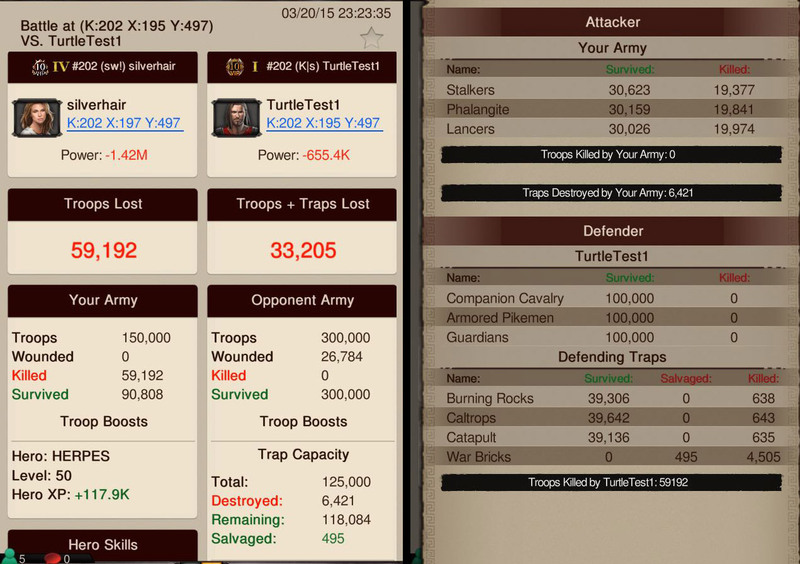 All attacks were performed with a balanced army of strategic T3 troops, which in this case was 150k strat T3. This test comprised a balanced mix of 300k regular T3, being 100k each of armoured pikemen, guardians and companion cavalry. The trap setup was 120k regular T3 traps, with 5k regular War Bricks as trap meat shield. 6421 traps were impacted by the attack, being 5000 War bricks, and almost 2ooo T3 traps. From a troop perspective, 26,784 of the defender’s T3 troops were wounded, and 59,192 of the attackers strategic T3 were killed. This test comprised a balanced mix of 300k strategic T3, being 100k each of Phlangites, Stalkers and Lancers. The trap setup was 120k regular T3 traps, with 5k regular War Bricks as trap meat shield. 6236 traps were impacted by the attack, being 5000 War bricks, and close to 2ooo T3 traps. From a troop perspective, 26,784 of the defender’s T3 troops were wounded, and 62,681 of the attackers strategic T3 were killed. This test comprised a balanced mix of 150k regular T3 and 150k strategic T3, being 50k of each type. The trap setup was 120k regular T3 traps, with 5k regular War Bricks as trap meat shield. 6060 traps were impacted by the attack, being 5000 war bricks, and around 1500 T3 traps. From a troop perspective, 26,784 of the defender’s T3 troops were wounded, and 60,937 of the attackers strategic T3 were killed. When these results are plotted on a graph, it becomes pretty obvious that the defensive capabilities of balanced armies of regular and strategic troops are identical. Exactly 26,784 troops were hospitalised with regular, strategic and an equal combination of both troop types. For those who have read the previous article on strat vs regular troops on this site won’t be particularly surprised by this result. On the other hand, strategic troops delivered more damage than their regular counterparts. 62,681 deaths is 5.9% more deaths than the 59,192 deaths delivered by the regular T3 troops. When looking at the mixed army of evenly split numbers of regular and strategic T3, what we would expect if we took the midpoint between these two results of 62,881 and 59,192 is 60,936.5 deaths. Instead of 60,936.5, the mixed army delivered 60,937 kills, so it looks like the strategic troops got lucky and benefited from a rounding up to a whole number of deaths. 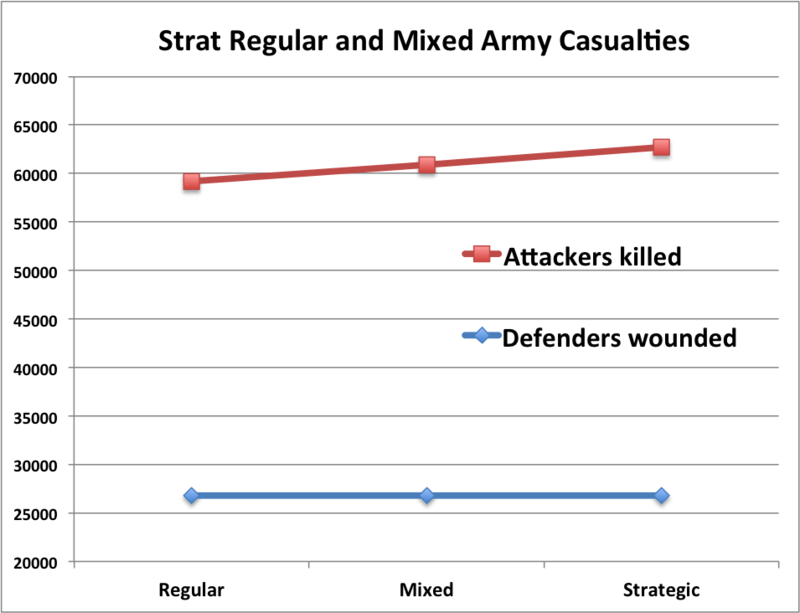 If we believed that there was a benefit from having a mixture of regular and strategic troops, what we would hope to see is either a reduction in the number of troop wounded, an increase in the number of troops killed, or both. What we see here is no apparent benefit from mixing regular and strategic troops together as part of a balanced defensive army. The mixed results are simply a direct average of the two individual results. There are no complex interactions with a mixture of regular and strat working together in harmony, fighting shoulder to shoulder, with the whole greater than the sum of its parts. It is just an average of both results. It is kind of disappointing that there is no apparent synergy, but to be honest, this is how just about everything we have seen in GoW, linear and additive, with simplicity generally preferred over complexity when it comes to combat dynamics. Part of the reason for doing these tests is the stories that get sent around of the value of strategic troops mixed in with regular troops, and we frequently get asked whether people should add strategic troops to their existing armies. The way I like to think about it is this: there is only benefit in training strategic troops if your strategic research levels are as good or better than your regular combat research levels. If your regular troop health is at 8 and all your strategic research is at 7, then it is likely that your regular troops will be as strong or stronger than your strategic troops. Strategic only become stronger as part of a balanced defensive army when the strategic research is as good or better than regular research. Adding strategic troops requires the same amount of research time but requires about 20-40% more silver and power than regular research, for a small incremental gain in terms of troop effectiveness (killing slightly more troops). Maximizing strategic research at academy level 18 adds around 5M power, another 5M to get them all to level 9, and then another 5M power at academy level 20 to get the individual strategic troop attack level 10s. So if you think of things in 5M power increments, you can decide whether you see value in adding strat troops up to level 8, taking them to level 9 strategic researches, or all the way to level 10 strategic troop attack, for a cumulative 15M research power. I would like you to consider a hypothetical scenario. For example, say you have a base power of 15M and 5M troop power, all in 208k regular T3, with all regular combat researches at level 8 as recommended in part 2 of this guide as a point at which to pause and consider how you want to proceed. As such, your overall power in this situation is 20M. What I want you to do now is go shopping. You have 10M power to spend, and you have to work out what is the best use of that 10M power, from the 4 options presented below. You have to make a decision as to how to proceed. Below are your options. Option 1: You could add another 5M power by undertaking the strategic research maxed for academy 18, and then add another 5M troop power in 208k strategic T3. Then you would have 10M troop power in 416k mixed t3, with half of them being up to 15% stronger, meaning that you are overall up to 7.5% stronger than an equivalent regular t3 army. Option 3: Or you could add another 10M troop power in the form of 406k regular T3, and not change research. What we have in the table below is a compilation of hypothetical calculations of the resulting army strength, based upon the strength numbers per tier outlined in part 5 of this guide. As such, 208k T3 each have a strength of 3 per troop, so the strength of that army is 624k. This is below as Existing troop strength. We then add some incremental research power, either 5M regular, 5M strat research, or 0 research. We then add additional troop power, and multiply the resultant strength by the multipliers explained below, being 15% increase for strat over regular, and 20% for level 9 regular T3 over level 8 regular T3. We then add the new troop strength onto existing troop strength to get Total army strength, and work out how much the army strength has increased by in the final row (Return on investment). In this table, we have assumed that strat troops are up to 15% stronger than regular once they are at the same research level, as per the results presented in the prior article on this site about strategic vs regular troops. The results do vary, so I think it is safe to assume that we are being optimistic here in assuming that the difference is 15%, when what is showed in the tests above is 5.9% more kills. But let’s give strat troops the benefit of the doubt in the balanced army scenario and round it up to 15%. When you look at the overall results of this hypothetical exercise, the return on investment you get from adding more lower tier troops (in this case T2), is twice as good as the return on investment you get from adding T3 troops, and at least three times the return on investment you get from using that 10M power to further increase your research from level 8 to level 9, or even add strategic troops and research to an existing regular troop army. 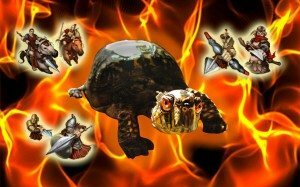 This article has focused on whether it is a good idea to add strategic troops to a turtle account that is designed to take solo hits, and ideally have an impressive strength / power ratio. 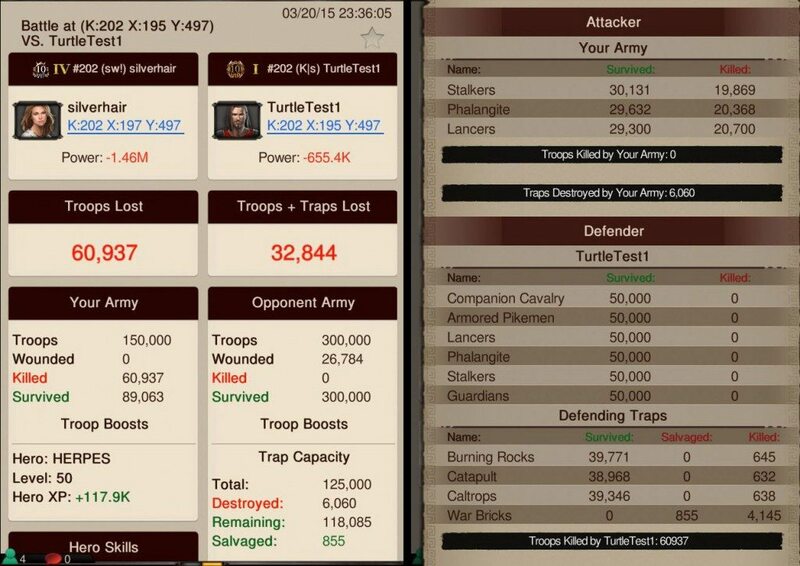 Whilst strategic troops are indeed stronger than regular troops, it is questionable whether that small 5-10% incremental damage increase delivered compared to regular troops is worth it in a turtle build where you have no limit on number of troops. It absolutely makes sense where you have a fixed constraint like maximum march size (375k), or maximum rally size (2.375M), or wonder reinforcements (2.375M), but in the turtle setting where you are trying to maximize army strength for the smallest increase in power, completing strategic research and training strategic troops, on top of your existing regular army, may not be the best way to spend a hypothetical 10M power. How you choose to spend your resources and speed-ups, whether on adding strategic troops and doing strategic research, increasing regular troop research, or adding additional T1-3 regular troops is your decision. This game is all about tradeoffs. For a turtle, to my way of thinking, adding more lower tier troops gives you much better bang for your power buck when a 2B player is going to hit you. But it comes with the tradeoff that it is destructible power that can be destroyed very quickly if your internet connection drops out for a few minutes, or if you have a shield glitch. You don’t get that with non-destructible research power. Only you can decide which path is best for you and your account. Hopefully this article has helped in your consideration of how to spend your next 10M power gain. But more importantly, it has briefly introduced considerations of the various components of combat boosts that need to be considered when trying to make your hero and army as strong as possible. The next part of this series will revisit the issue of wall traps, and start doing some testing of various hero skill points allocations and hero gear sets for various boosts, before moving to the second last piece in this series, which will look in a bit more detail at combat boosts and hero gear. What we will be striving for in that article is an understanding of the various ways you can maximise your various combat boosts (like troop health), being an addition of research, hero skill points, hero gear, gems, and other miscellaneous boosts like VIP boosts and altar boosts. Hi, could you point me towards an article/review on how to become a trap that can take rallies? I want to make myself into a trap that can fight at the wonder. I’m at 70 mil power. I have t4 unlocked. I have 520k beds. Currently am at 600k t1, 600k t3 and around 200k t2. 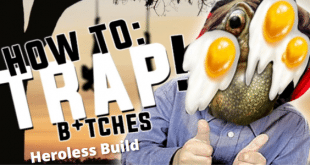 Do you plan on having any reviews/guides for non-solo hit trap accounts? I’m especially interested in what further research should be done/what my troops should look like. Given that I could probably still be a rally/wonder trap at around 180 mil power, is the defense branch worth doing? What about cores? Given the current troop/strength ratio of t3 and t4, should I just make solely t4? In order to maximize the amount of troops I can catch in hosp beds, should I solely create t4? Aside from the added rss cost (which isn’t an issue for me), I don’t see the downside. Thank you!!! There is no downside. On defense, T3 basically equals T4 on a power/strength perspective, the only difference is resource / time cost. If all you want to do is ensure you don’t go over hospital bed capacity, have the body of your army as T4, and train a single troop type meat shield out of T3. Note that under the old points scheme, this is much more effective with T2 in terms of points given up, because T2 hospitalised are 1 point vs 20 points for T3. Is there any point in using trap attack gems for turtles..i have a sh 21 t3 turtle about 600k T3 and 150 k T1 ? I assume that will increase kills but not reduce losses as much as extra health and defense gems but if my beds are good could help get more points which was my issue last kvk got 28 mill needed 33 . Also setting points for trap attack and or troop healing?/> i maxed out 2 of 3 of the troop types and of course health and defense…..as you have pointed out , troop healing is dependent on troop training but i figure mostly its instant heal for the t1s,….thinking i need some t2 behind them as well to save speeds for healing . Thanks for all your advice…my turtle was really effective and even though a little over powered with 700 k t4 and extraneous research from previous owner and quest power, at 43 million he took a lot of hits and won as long as i kept him strong….I kind of like th et3 model because i can go on offense as long as i keep my hero close and really piss people off when i repeatedly take their heroes. I’ve learned a lot by reading these articles.. Thank you. I lost a lot today on an account and figured I might be able to turn it in to a turtle account but not sure. I was left with 400K T4 troops, 400k beds, and 125k T4 traps. Since I haven’t really read to much about T4 turtle accounts is it something that could be done? It depends upon your base power. It is very hard to have a T4 troop account as a turtle, because research power is usually at least 30M. Adding 7M or so for buildings, 5M hero, you end up with a base of at least 40M before troops. I’m not saying it can’t be done, but your success as a turtle is based upon getting people to hit you regularly. If you are 70M, then there are not a lot of attackers who will solo attack you these days, at least not regularly enough to make it worthwhile. I’ve actually found that you either need to be under 30 mil or you need to push all the way up to 70-80. People seem to assume that you’re not a trap once you reach a certain power. And there are so many 500+ mil players who solo hit a 70-80 regularly. I’ve had great success with those types of power. I was zeroed out today but left with what I believe could be turned in to a turtle account, but I’m not sure. I was left with 400k T4 troops, 400k beds, and 125k T4 traps… Let’s just say I was rallied numerous times today and lost a lot. Can this be a start to an efficient turtle? How to counter measure trap accounts? They are becoming a nuisance now as everyone is running trap accounts and tile hitting people to bait. Is there no way to give them a decisive blow? except catch them on tile too? There’s no other way at all? Rally them. Or load up on level 6 cores with 3 buddies with level 6 cores and hit them hard and fast. Do the latest Defense research. Rallying is cheaper and more effective, but you have to be quick to get them. GREAT articles, I’m totally hooked. I am curious to hear how many T1 troops is a good amount to start participating and taking hits. I’m at Sh lvl 18, I understand that 8 million was chosen to fit the 16million power budget. I also know that hero level and gear choices play into it. I have completed all my research and am anxious to turn my barracks into hospitals and join the fight. I have comfortably run around with 3-4M T1, given 4M is equivalent in strength to 2M T2, or 1.3M T3. Then it all comes down to the differential between your hero gear and the attackers hero gear, and your hospital bed capacity. If you are ONLY going to take hits, then 3-4M is doable. But if you start attacking as solo attacks, or participating in rallies, you will quickly lose troops. If you do any attacking, I strongly suggest starting with more than 3-4M T1. But it really comes down to gear differentials in the end. Silverhair, I am enjoying your articles on turtle accounts. I am fairly new to GOW. My main account it almost 200 million power. I am actually having more fun building turtle accounts and using them. On my latest turtle, I decided to try the 16 million T1, strategic troop approach. I am staying at stronghold 18. I have 16 million strategic troops trained and am finishing up the research. One question that I have is, do I need to do the regular combat research? I only researched enough to open the strategic side. I have done all other research needed, according to your turtle articles. I am just a little confused as what to do on the regular combat research. Once again, I am enjoying your articles and appreciate your hard work and dedication. Stick to the minimum regular research if you have focused on strat combat research. No need to duplicate research. Enjoy. Very happy to hear you are enjoying playing as a turtle. Thanks for info on your experience with NERF levels. 8M is definitely not NERFed, and enough for most turtle accounts. 20M T1 is a badass turtle!!!! Looks like they are changing the KE points to power destroyed. Am I mistaken to think that now a hospitalized troop = same number of points as a killed troop? If that is true then I think having t1 meat shields on your turtle is now more imperative. But would be interested to hear Silver’s thoughts on the matter. Is that a permanent change to KE? I find it hard to believe that they will equate hospitalized with killed units, since hospitalized isn’t really destroyed power. Guess we will see on Thursday. Yes, Enemy power destroyed appears to be replacing KE points system. This will shift it back slightly towards T3-4 play, and make the gap between T2 and T3 smaller, so T3 meat shields may come back into plays having mostly been replaced by T2 meat shields for those concerned with KE points. And the massive KE benefit of hospitalised T1 or T2 will be reduced, as they will still incur power loss. It will however mean that it makes even more sense to prioritise T1 over T2, as long as you have enough hospital beds to catch them all. Will address it in more detail in the final post of this series on sustainability of accounts and GoW changes. Thanks Slaggy …is there a bigger bang for the buck when taking in to account a mono attack? And is difference between regs and start greatly increased when popping cores and you have a 600-1400% calf attack boost for example? I had wondered about cores. It seemed that many lower level cores affect either regular or strategic troops, but not always both. Sometimes one is even penalized, while the other gets a bonus. Will cover off some of that in a series on solo march attacking. But after we conclude discussion of defensively focused turtles. Thanks Sliverhair, this has been very informative and is changing the way I play. I have two sh14’s that I converted before reading this series and now I have a new account that I am trying to build based on your research.